Attention: parents and kindergarten supervisors! Put the skill-trainer on children’s fingers, as shown in the picture. Now teach the ostrich to move. This playful exercise will assist in the development of fine motor skills and hand coordination. The Baby Ostrich can walk, run, jump over the barriers, tilt her head, dance, play football, raise different objects and perform any other tricks that the child can invent. The child can put the colored rings on the long neck of the Baby Ostrich. Made of soft and flexible material, the Toddler Baby Ostrich easily fits on the Index and middle finger of either hand of the child. 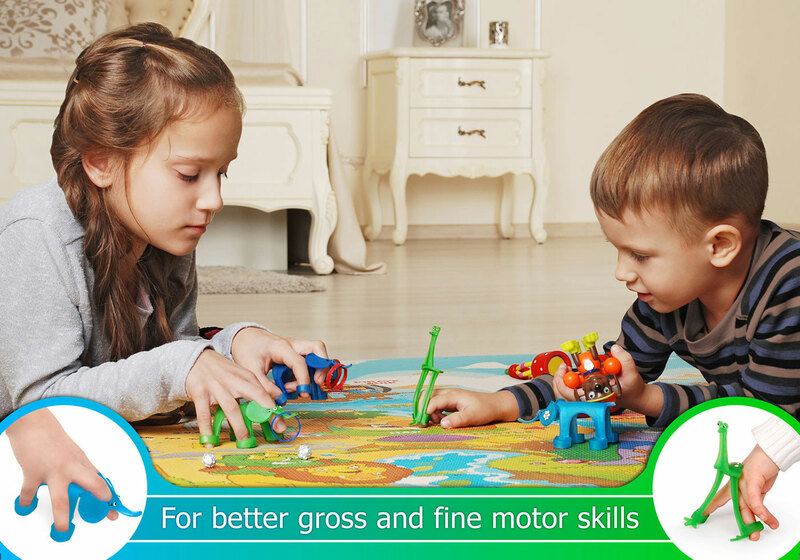 After the child plays for a few weeks with the finger trainer, you’ll be surprised by how strong his hands become, how quickly he writes, and the stamina and dexterity with which he performs complex tasks with small objects. The Toddler Baby Ostrich is a 3-in-1 game: an intelligent finger trainer, a tabletop game, and a travel game. Recommended for children aged 3-7 (for right and left hand).